Besides setting records and opening restaurants, the ambitious 34-year-old is plotting a culinary revolution. Bakhriddin Chustiy feels uneasy about being likened to Jamie Oliver. It is not that he doesn’t admire the world-famous British chef. It is just too early, he told Eurasianet. 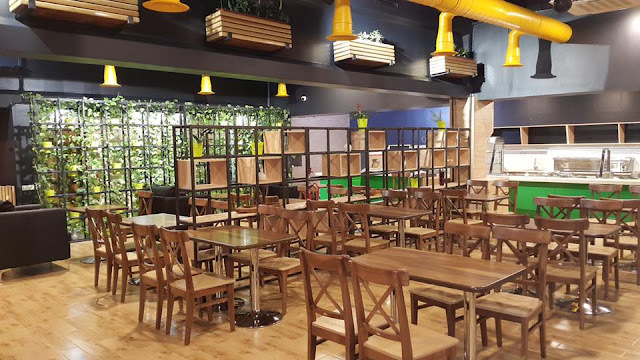 "One on hand this makes me happy, but on the other, we have a long way to go before reaching the level of Jamie Oliver," Chustiy said, sitting in a corner sofa at his newly opened restaurant in Uzbekistan’s capital. Open his own restaurants: done. Cook up a serving of plov so huge it would earn a berth in the Guinness Book of World Records: done. The last goal, to set up a house of Uzbek culinary arts, is a work in progress. Chustiy owes his current trajectory to an unlikely person. In August 2010, when Chustiy was working in an Uzbek restaurant in the southern Russian city of Sochi, he was summoned by the mayor, a regular diner, to come cook for a special guest. It was then-President Dmitry Medvedev. The meal was a hit. 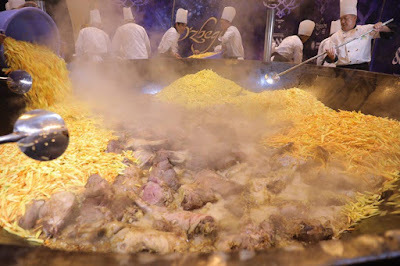 "Medvedev came to me to congratulate me and asked if this was real Uzbek rice we were putting in the plov. I answered that, yes, all the ingredients were from Uzbekistan," Chustiy recalled. That encounter was the confidence-boosting event that spurred the Ferghana Valley boy into setting his objectives higher. There are no chefs in Chustiy’s family. His father was a middle-school teacher and ran a small shop on the side. His mother worked in a kindergarten. Chustiy is not even his real surname. Bakhriddin Najmiddinov’s nom de cuisine was inspired by his family’s native village, Chust, which is a 45-minute drive west of the Ferghana Valley city of Namangan. In 1998, the family moved to Tashkent in search of a better life. There, they opened a bakery, marking Chustiy’s first foray into cooking. The fledgling business also sold drinks and chebureki, a deep-fried turnover with a mince and onion filling. It was a large family and Chustiy was the oldest of six children. After his father died in 2002, Chustiy ditched any thoughts of continuing his studies since he had to concentrate on providing for his family. He never completed middle school. In 2007, he went to Moscow with hopes of finding employment in a cafe. To his disappointment, all he found to begin with was work as a dishwasher. His break came two months after his arrival, when a chef’s job freed up at the restaurant where he was doing the dishes. At the start of 2011, he moved to the Turkish resort town of Antalya and got a job cooking in an Uzbek restaurant there. It was around that time he set up a now-defunct website called Oshxona.uz and began blogging about the culinary arts of his native land. "That is how I really began to earn some popularity on the internet. 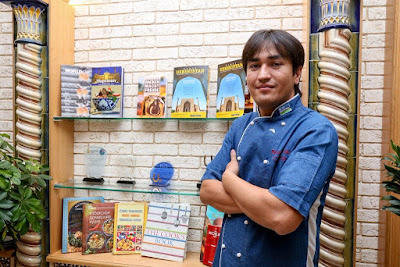 In 2013, I returned to Uzbekistan and I opened my first restaurant in Chust. With friends and business partners I opened another two places in Tashkent," he said. In 2017, he published 365 Days of Sun, a photograph-rich compendium of national cooking. An English-language edition of the book was published the same year and presented at a function in London organized by the Uzbek Embassy. While in town, he tried to look up Jamie Oliver, but to no avail. That was the same year he oversaw the cooking of a 7.3-ton serving of plov. Representatives of the Guinness Book were there to record the achievement – as was portly U.S. B-list action star Steven Seagal, for some reason. That stunt belies Chustiy’s real stated ultimate intention though, which is to transition away from the pile-it-high and sell-it-cheap model. Doing that will mean weaning Uzbek cuisine off its often unhealthy obsession with fat and throwing new flavors into the mix. "Uzbek cuisine is still very homely, not for the restaurant. We need to make more of an effort to present it in a new format so that it would be accepted around the world alongside French or Italian cuisine," he told Eurasianet. "When somebody comes to a restaurant, they should get pleasure not just from the taste but also from the appearance of the dish, because it is that, after all, that makes the first impression." Akbar Umarov, chairman of the Association of Chefs of Uzbekistan, agrees, but cautions against throwing away the baby with the bathwater. "If we want to promote the popularity of Uzbek cuisine overseas, we need to attain international standards. But at the same time, we cannot forget distinct national traits,” Umarov told Eurasianet. Not that everything has gone smoothly for Chustiy. In 2015, he dabbled with creating a fast-food chain: Tez food – from the Uzbek word tez, meaning fast – committed to providing an Uzbek spin on familiar American fare, like hamburgers. The idea failed to catch on. Chustiy is not eager to revisit the failure, although he says he may return to the idea somewhere down the road. In what feels like an almost blasphemous revelation, Chustiy admits that plov, the dish to which he owes his popularity, leaves him reasonably indifferent. His passion is for flour-based dishes. One favorite is Uzbek naryn, a soupy dish of noodles and horse meat. Chustiy is an inveterate experimenter. He says he has developed around 70 variations on the classic Uzbek repertoire. Most of them are available at his four restaurants. The newest restaurant, Aksu, Uzbek for “white water,” opened at the start of the year. It may have been rushed, however – the smell of fresh paint still lingers in the air. That fourth point in the plan still remains. Chustiy said he is tired of taking part in TV cookery shows and giving master classes. 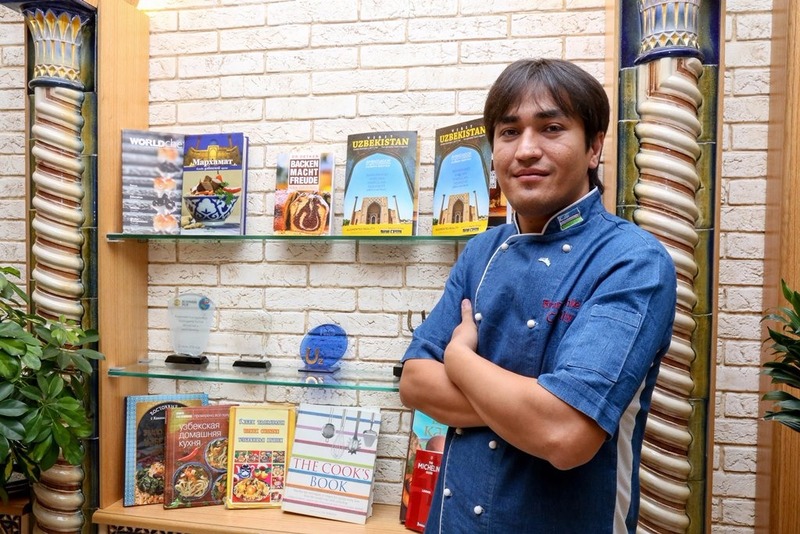 Creating a house of Uzbek cuisine will be the culmination of his efforts. “This is a big project. We will have a restaurant, a school, a hotel and a library. 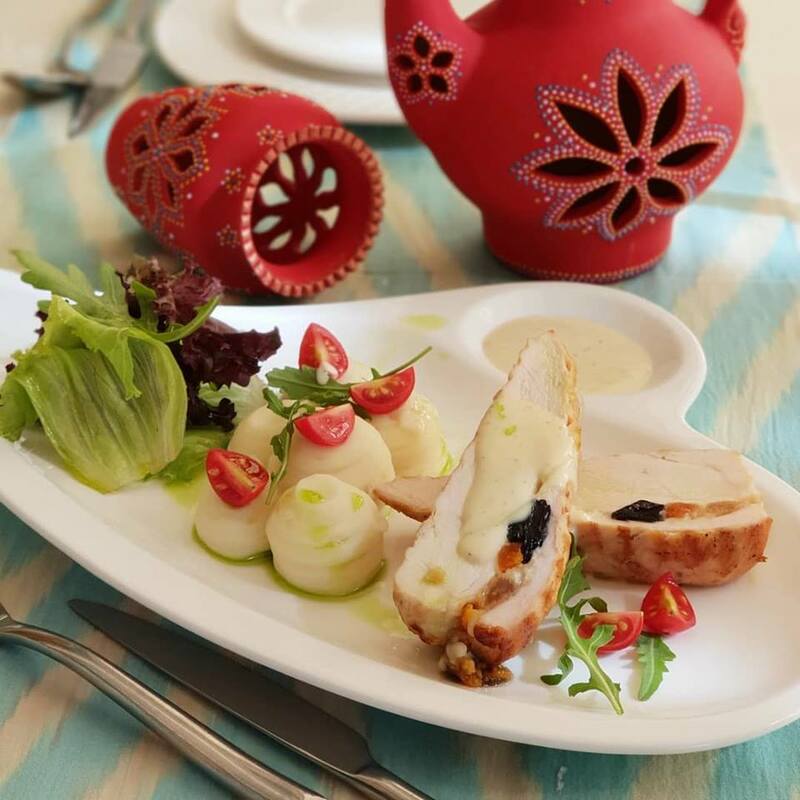 Chefs will come here from all over the world to become specialists in Uzbek cuisine. But this will cost a lot of money to do and this is just a plan for the time being,” he said. Uzbek Journeys note: Chustiy's restaurants and other "family restaurants" in Tashkent are alcohol-free, however, often fresh juices such as carrot and apple, are available. Call ahead to check. This article was originally published on Eurasianet, 7 February 2019.